When things get worse on your Windows machine, the last resort that you should choose to employ is reformat. We’re saying that it should be the last because this solution basically deletes everything that is stored on your hard drive except of course of you have another partition in which backups of all your important data are stored. However, if your purpose is to delete virus that has crept into all your computer’s drives and system locations and infected almost all of the files that are stored in it then a reformat really is the best option to choose. Worst scenarios like this are the reasons why experts always advise ordinary users to keep a backup of everything in a portable hard drive or in a cloud. If you’ve been in a situation where you are left with no other choice but to reformat because your computer already refuses to boot up or it does not allow you to log in due to a very fatal problem then you need to read this tutorial towards the end because in here, we are going to teach you how to create a tool that will serve as your secret weapon in times when your Windows machine gets into a very bad circumstance. If you’ve been using Windows for a long time and you’ve already had worst experiences with it which can be called “nightmares” to some extent caused by viruses and malware that cripples the operating system as a whole then you should have met most of the repair and recovery tools in it. There’s the recovery image tool, system and startup repair and many others but what we want to focus in this tutorial is the one that is called “System Recovery”. The tool itself is created using a USB flashdrive and it can actually help you repair your computer even when you can no longer access or login to it because of an error or problem. 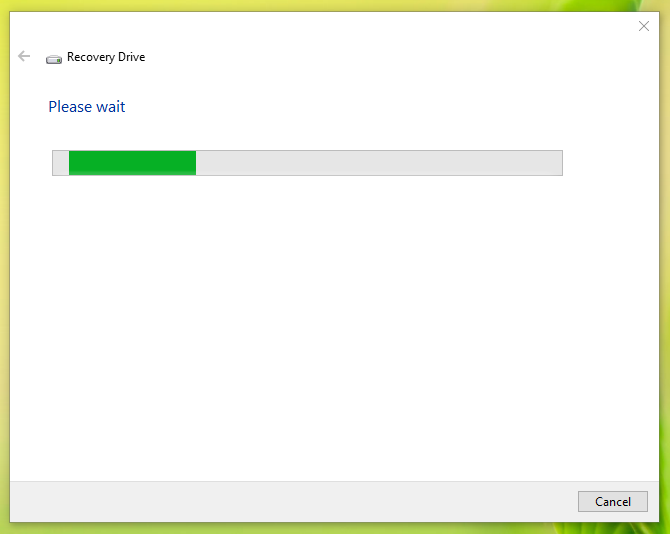 We are going to discuss how this tool is used when this worst case scenario happens on your computer in our next tutorial so for now, we will first be learning how to create a System Recovery Drive in Windows so we’ll have something to use when we get into the next tutorial. Before being able to create a Recover Media or System Recovery Drive for your computer, you will first need to access the tool that will help and guide you through the steps in creating it but before starting with the process, you will first need to secure a USB flashdrive that has at least 4-8GB of storage. Once you have it, we can start by first accessing the Search box and you can do this by pressing the Windows + S keys on your machine’s keyboard. After pressing the keys, the Search box should now pop-up on the bottom-left portion of your computer screen and from here, you will simply need to type the words “system recovery” into the search input box that is found at the bottom and on the search results that would appear just above it, simply click on the shortcut that says “Recovery” as you can see below. 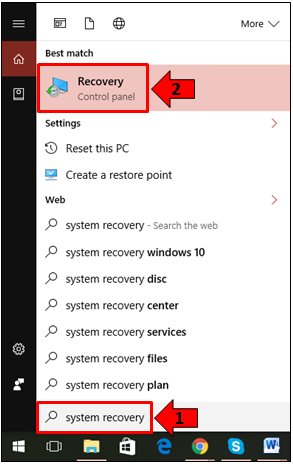 After clicking on the shortcut, you will be able to open a Control Panel Window that shows the “Recover” section and from here, you will see the different options and tools that are available for repairing your computer when things get really worse. From here, all you need to do is click on the link that says “Create a recovery drive” as you can see being highlighted below and this is where we will be starting everything. If you already have the USB flashdrive that you want to become your recovery drive, we strongly advice that you backup anything important that is saved in it first then format it so that it will be clean and ready to accept the files that will be loaded to it by the System Recovery Drive Creator tool. First of all, you will need to attach the USB flashdrive that you want to use as a recovery drive and now that you are already on the “Recovery” section of the Control Panel and if you’ve already clicked on the “Create a recovery drive” link, you should be able to see a prompt coming from User Account Control asking you to confirm the action that you want to do which is starting the tool itself. From this prompt, just click on the “Yes” button and the Recovery Media Creator tool will now start and it should look exactly like the one shown below. 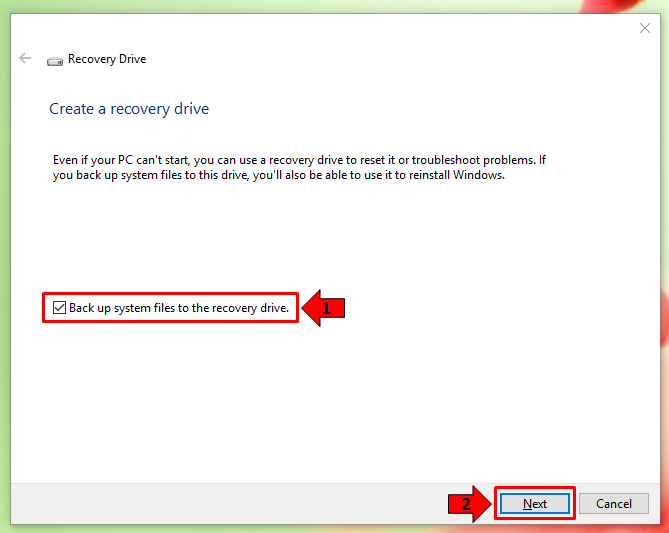 As you can see, there is an option that says “Back up system files to the recovery drive.” as highlighted on the screenshot above. 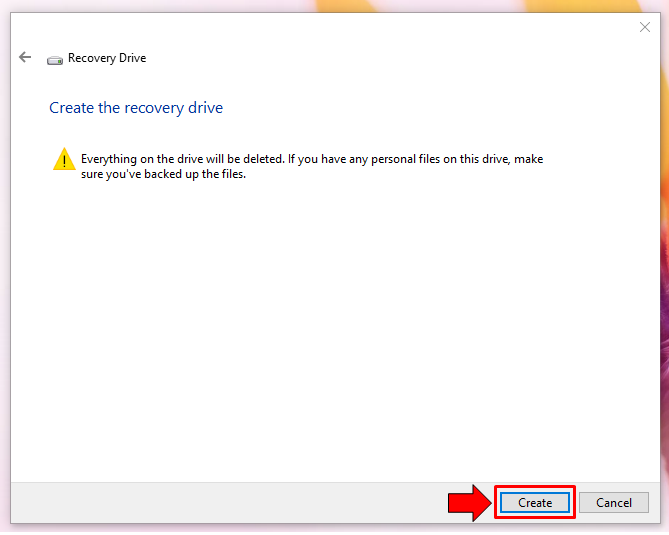 This option is enabled by default so we would recommend that you keep it that way in order to make sure that the Recovery Drive which you are going to create would really help repair your computer since the system files are also copied to it. Once you are ready to create the tool, all you need to do is click on the button that is found on the bottom-right portion of the screen which says “Next” as you can see on the screenshot above. The Window that follows will then show an initializing bar and a prompt that says “Please wait” as shown on the screenshot below. On this stage, you can just continue on with whatever it is that you are currently doing on your computer. It takes a few minutes or even longer especially if you have chosen to save even the system files into the recovery drive that you are about to create. The next Window will now tell you that the USB flashdrive that you should use needs to at least have 8GB of storage space and if you haven’t created a backup of its contents yet and deleted everything that is stored in it then this next step will do that for you. We strongly advice that you check your USB flashdrive first or back up its contents before hitting the “Next” button. If you are confident that you don’t have anything important stored in it then you can simply go on with the process and hit the “Next” button right away. 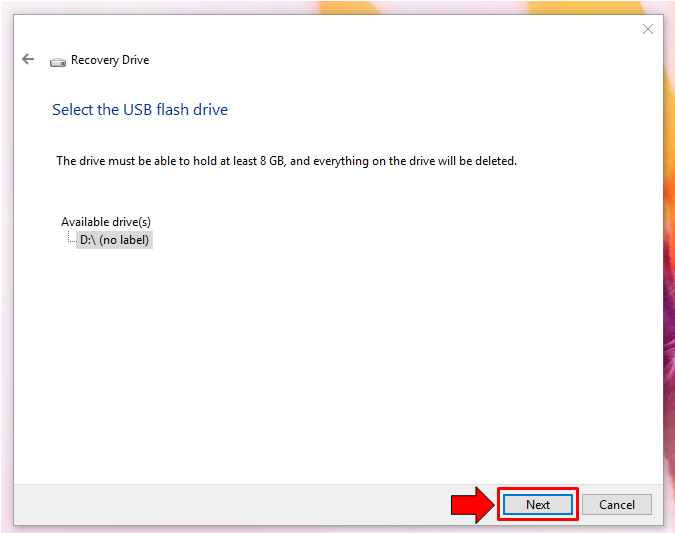 If there are more than 1 USB flashdrive that is attached to your computer, you should be able to see them listed on this step and all you need to do is select the right one among them. You can confirm which USB flashdrive is the right one by checking its drive letter on File Explorer. After clicking on the “Next” button, the tool will again show a prompt telling you that all of the files (if any) that is stored in the USB flashdrive that you want to use as recovery drive will be deleted for good and advice you to backup anything that is important that you might have stored in it. Once you are ready, just hit the “Create” button as shown on the screenshot below. The process will then start and it will take quite some time especially if you have chosen to copy even system files to your recovery drive. Just wait for the drive to be created and you will know when it’s almost done because of the progress bar that is displayed and as well as the description of the task that the Recovery Media Creator tool is currently doing as you can see on the screenshot below. Once the recovery drive is created, Windows 10 will automatically inform you with a prompt which says that the drive is ready. From here, you will see a button that is found at the bottom-right portion which says “Finish” and you will simply need to click on it to be able to exit from the Recovery Media Creator Window. 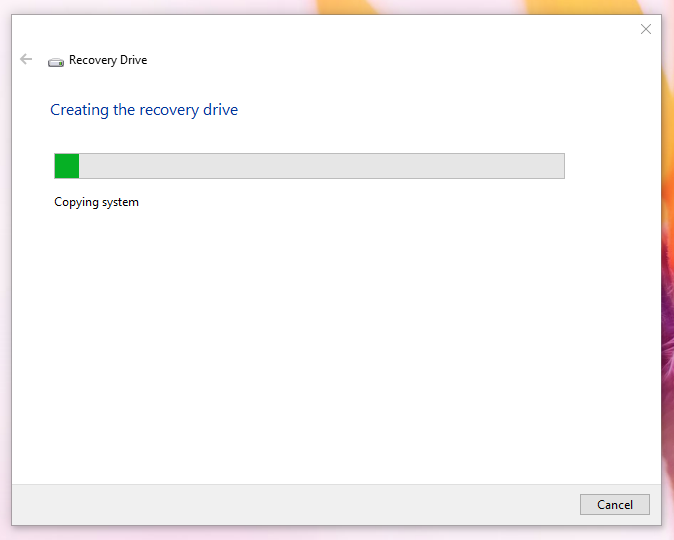 What is the Recovery Drive Used For? Problems, errors and other serious troubles can occur in your Windows machine at any time especially if you have not protected it with a good antivirus/antimalware program and when these sort of things happen, you will no longer need to do a system-wide reformat or clean install process if you have a Recovery Drive with you. A reformat or clean install process deletes everything and this is a very big problem especially if you didn’t have the chance to backup your stuff and your computer is already malfunctioning and refuses to allow you to log in. 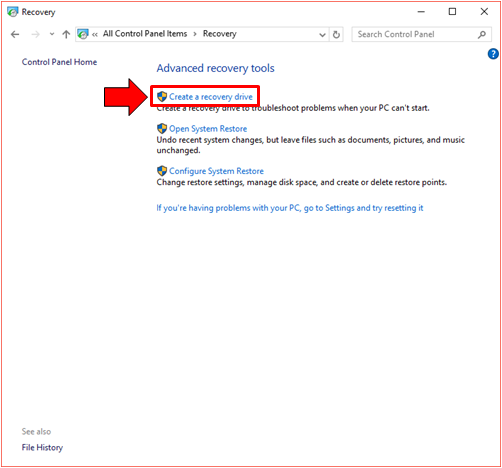 In case this happens, you can use the recovery media that we have created in this tutorial and if you want to learn the steps in how to do this on your Windows 10 machine, you’ll need to read our next tutorial which will explain how to use the Recovery Drive tool when your Windows 10 machine no longer boots up properly.